Tender and crisp, warm spinach leaves tossed in hot olive oil and fresh lemon juice. The flavors are absolutely perfect together. I’ve been making this recipe for years and it is my favorite way to eat cooked spinach. I was surprised the other day when I noticed that I hadn’t posted it yet. So, I snapped a quick picture of my plate the other night at dinner. I served this with some leftover chicken and it was a quick and easy dinner on a busy night. My kids are not fans of this dish. As they have told me numerous times; they love spinach in salads, soups and smoothies, but not all by itself. Oh well, it just means more for my husband and me! Sort through the spinach, discarding stems (or including them if using baby spinach). Wash the spinach in cold water. Then spin dry or gently pat dry with towel. 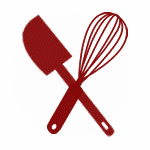 Heat the oil in a large skillet or saute pan over medium high heat. Add the garlic and lemon juice and saute just until fragrant, about a minute. Turn the heat to high, add the spinach, salt and pepper. Barely wilt the spinach, tossing quickly with tongs to coat all the leaves with the hot lemony garlic oil mixture. Toss in the pine nuts and add salt and pepper as needed. * The spinach will cook VERY quickly in the hot oil. The goal is to just barely wilt it and leave it tender and still a bit crisp. The whole process takes just a few minutes total. I just bought some baby spinach at the store this morning. 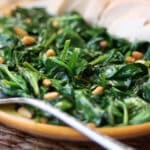 The pine nuts are a great addition since it gives this spinach a little crunch! Oh this looks so delicious!! I love spinach prepared almost any way!! This sounds delicious. I love spinach, but usually eat it in a salad. A must try. I love spinach any which way and this looks simple and delicious! Too bad your kids don't like it but, like you said, more for you :-) I also love a similar dish with spinach, raisins, pine nuts, and a dash of balsamic. 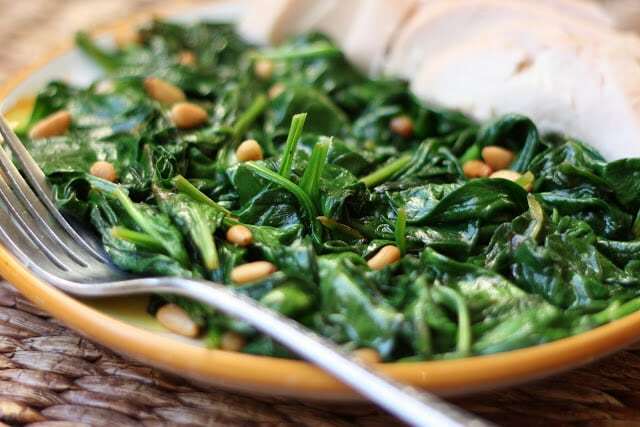 Spinach is one of my favorite sides but I don't think I've every tried it with pine nuts. I'll give your version a shot, it sounds bright and good. wow this is a healthy appetizer spinach is rich with anti oxidant such as Vit E and C while the pine nuts is high in protein. The pine nuts I have are raw and you mentioned roasted. How do you roast your pine nuts? I typically toast them in a skillet until they are fragrant and lightly browned. You can also roast them in the oven, but I find the skillet method simpler for a small handful.